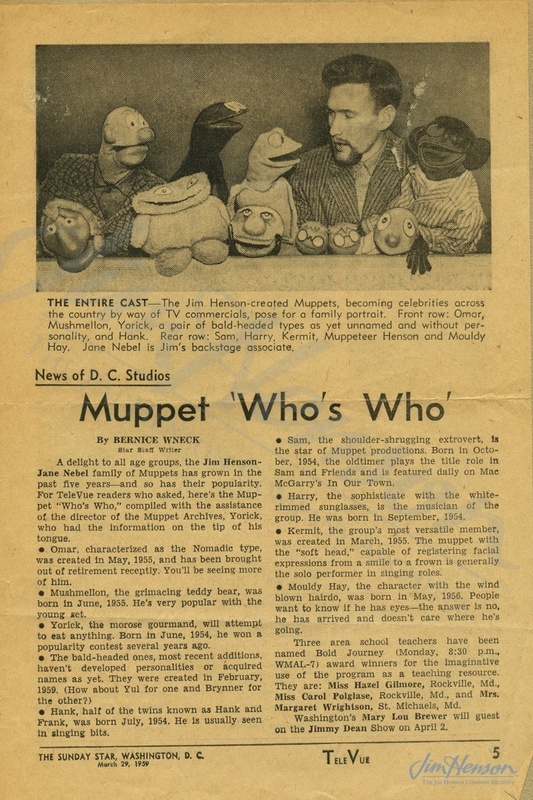 When Jim went down to Washington in January 1975 to deliver the first Ernie and Bert puppets to the Smithsonian for display, it was a trip home. Having grown up just outside the city limits in University Park, Maryland, attending high school in Hyattsville and college down the road at the University of Maryland, Jim had many friends in the area. One of his closest from his student days was Joe Irwin. They had taken a cross country road trip together in the mid-‘50s, visiting the Grand Canyon, and when Jim went to Europe in 1958, Irwin travelled with him for the first part of the trip. In 1959, when Jim married Jane Nebel, Irwin served as Jim’s best man. It was only natural then that when Jim came back to Washington, marking twenty years on television by lending his Sesame Street stars to the Smithsonian, he might celebrate at dinner with Irwin who had been there at the beginning. Learn more about the many ties between Jim Henson and The Smithsonian Institution. The characters from Jim’s first show, Sam and Friends (1955-1961), including the original Kermit, are the most recent Henson additions to the Smithsonian collections. This entry was posted in 01-January '75, 1975, Appearances, Sesame Street and tagged Bert, Ernie, Joe Irwin, Smithsonian, washington DC. Bookmark the permalink.